Taking place in secondary schools in Haldimand, Norfolk, and Brant counties over two days, the annual Art Soup invites students in Grades 4, 5, and 6 to get hands-on in each artistic practice, culminating in a talent showcase at the end of each day. 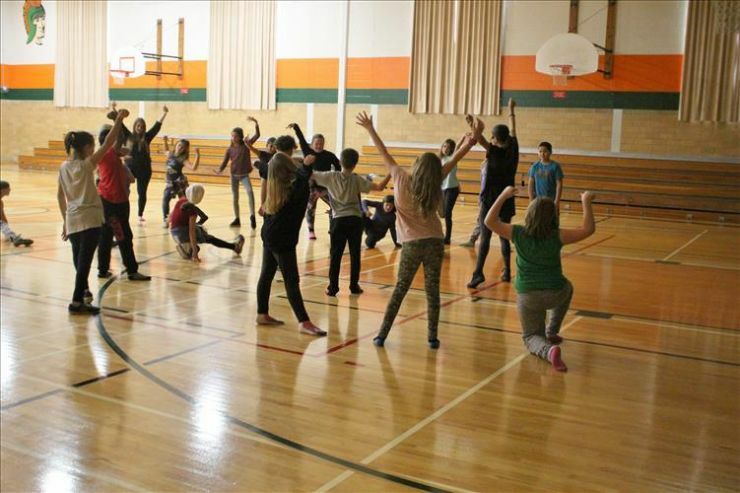 In the gym at North Park Collegiate and Vocational School, hip hop music is blasting through the sound system as dancer and educator Dani Nobrega instructs Cedarland Public School students to strike a pose before they switch gears as the music changes to a waltz. Nobrega is one of several professionals in her field working with students in Grand Erie today. Scheduled on secondary school turnaround days following exams, the workshops also aim to increase elementary students’ comfort levels with their local secondary school, familiarizing them with the buildings and the facilities that each offers.